Right now we are possibly experiencing one of the most challenging times of the year to catch a fish. Probably the two most significant obstacles in our way are the weather and our lack of enthusiasm to get out of the comfort of our warm homes and go fishing. Lately, we've had some calm days, but there have been few boats on the water. Uncharacteristically my boat has been parked up in the garage over most of the winter too, but that's mostly due to the weather opportunities not lining up with my available fishing time (ok, the truth is that like everyone else, it was nice and cosy sitting inside with the fire going). In my opinion, another reason why this time of the year gets a bad rap is that most northern New Zealanders are snapper obsessed and the methods that were so successful over summer just aren't working for them. One slow day and it's a good excuse to put the boat away! There are two solutions to that problem – fish for something different or fish differently. For example, snapper are going to be few and far between in the harbour for the next few weeks, possibly months. 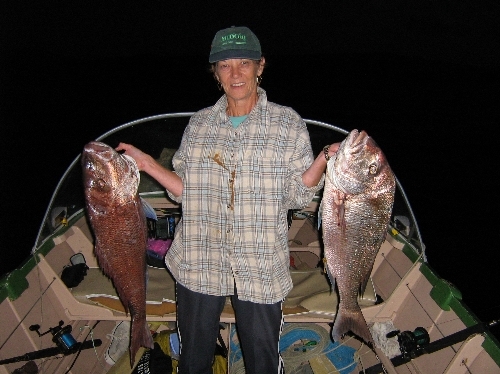 A perfect opportunity to try for gurnard, kahawai and trevally. Gurnard are best targeted on the edges of the channels where they first start to rise from the depths or where the channels start to flatten off as they go up onto the banks. Trevally love to eat shellfish and shrimps and there is no better way to fish for them in the harbour than on a flooding tide over a shellfish bed. Straylines and small baits work well. If by some weird twist of fate you can't find a kahawai, look for terns or gannets working an area. A small jig or soft bait cast into the action will rarely let you down. Possibly the most consistent areas to find big kahawai in the harbour would be the area from Pupunga across to Big Bay right through to the harbour entrance. It's a vast open area that can cut up rough when any significant wind opposes the tide – especially on the big tides, so choose your times well. If you want to catch snapper this time of the year, then you need to fish off the west coast. Your best option is to head out deep to 60m or more and head south from the Manukau bar. If you have knowledge of the Waikato River bar, then that's an even better option, but you do need local knowledge before you venture out there. Knowing the harbour bar counts for nothing on the river. Choose the small swells, understand the dynamics of the river and read the conditions well and it's all good. Get any one of those wrong, and I'll be watching yet another Westpac helicopter flying over my house. Off the coast, snapper and gurnard are available year-round, but sharks will often turn up to spoil the party. Big tope wreck your traces, tangle your lines and bite off your hooks but they are a blessing compared to spiny dogfish. Although much smaller, these things can be prolific and handled incorrectly they will wrap around your forearm and whack you with their nasty spines. There are a few tricks to beating them though. You can move, move or move. Preferably move deeper. Jigs will often weed out the sharks too, but in this cold weather, snapper can be very shy on the bite, so your lures need to be small and fished slowly. Smaller baits are probably your best bet. I know that sounds like just too much to be bothered with but if you get a good catch of snapper out there in winter time – and that is not at all unusual – you will be heading home with a huge grin. Here's an even better idea though. As soon as we get to mid-September, take the first opportunity after that when the swell and tides all align, and you will get some of the best snapper fishing you could possibly hope for. The spring run of snapper in 60 to 65m out west is something special. Jigs work exceptionally well too and are a heap of fun. One of my favourites is the Catch SquidWings in 80g. Green, red and gold are all colours that work well. Meanwhile, the talk of my small town is the start of the whitebait season. It kicks off on August 15. Even more talked about though, is scallop season. We can go out and get these tasty little creatures once the season opens on September 1 but be warned; there is a shellfish biotoxin alert in force from Port Waikato down to Taranaki. Let's hope it doesn't spread north. Take care out there and get ready for what will be a very productive springtime!